We did it again, y’all. For the third year in a row, we bring to you the hidden cultures of the southern swampers, urban hoodoos and hill folk in our highly successful annual publication HOODOO ALMANAC 2014-2015. An entertaining and educational collection of conjure and practical information for rootworkers, folk magicians, folklorists, researchers and spiritualists, HOODOO ALMANAC 2014-2015 contains herbal cures and medicines, tarotscopes, conjure formulas, calendars of notable days, numerology, lucky lotto tips, gardening tricks for rootworkers, Who’s Who in Hoodoo History, and conjure works of all types and varieties. And that’s just the tip of the root! Civic Holidays and Observances. This is our calendar of days formally recognized by the federal government such as Memorial Day and Independence Day. Popular Holidays and Observances. This calendar includes days that are recognized by a large segment of the general public, like Mardi Gras and Valentine’s Day. Pagan Sabats, Esbats and Observances. This calendar includes observances of the Western hemisphere such as lunar cycles, seasons, the 8 sabats and the pagan deity festivals celebrated by pagans, Wiccans, and Witches. Religious Holidays and Observances. This calendar includes religious holidays and observances of the Christian, Jewish, Islam and Buddhist faiths. Voudou Holidays and Feast Days. This calendar includes feast days of the loas and orishas as observed by Haitian Vodou and New Orleans Voudou. These days my vary according to individual houses and temples; however, the ones we provide are commonly recognized. Hoodoo Notable Days and Observances. Of course, we are the first to introduce a Hoodoo calendar and so our calendar is subject to those days we feel are important to African American history as it relates to the practice of Hoodoo and rootwork. We have included birthdays of notable people in Hoodoo history as well as some of the saints and folk saints found on altars of practitioners nationwide. Spiritualist Feast Days and Observances. This calendar includes the feast days and observances of the Spiritualist Churches. There are variances between Churches depending on the specific spirits served in the respective Churches; but, we have included those days that seen to be common among all Churches and in particular those found in the New Orleans area. Calendar of Catholic Saints. We anticipate this particular calendar to be among our most popular as it is the most heavily requested category of information through our website. Because there are literally thousands of saints there is no way to include them all here, so we have focused on those saints that are among the most popular with Catholics, New Orleans Voudouists and Hoodoo practitioners who incorporate them in their practice. Calendar of Folk Saints. Since the calendar of Catholic Saints is so extensive, we have separated the folk saints into their own category. We have expanded our inclusion of Latin American folk saints - both those who are not recognized by the Catholic Church and others who have a history of cultural relevance in their regions of origin. Rootworker Conjure Calendar. This is our calendar of general information of gardening tips and conjure tricks with plants, herbs and roots. Depending on where you live, of course, will determine the best times for growing and harvesting herbs in your area so you will need to take that into consideration. Beyond our awesome calendar pages, we have our seasonal lore and miscellany and several articles on numerology, lucky lotto and a special guide to dreams and lucky numbers. We've got herbal tea remedies courtesy of Celeste Heldstab, our guest contributor, prayers to the seven saints of New Orleans, old-tyme conjure dirts and dusts, traditional methods for preventing conjury, communicating with spirits, weather lore and proverbs and a plethora of tips and tricks for the modern day practitioner. But wait! That's not all! We have profiles of notable African Americans Susie King Taylor, Sarah Breedlove Walker and Henry Bibb! An introduction to Honey Jars, conjure oil formulas, curious conjure receipts and down home southern recipes with a magickal flair! And just when you think there can't possibly be anything more, just wait until you see just how much more we have waiting for you! If you are a serious lover of authentic southern folk magic and folk lore, you will love the Hoodoo Almanac 2014-2015. 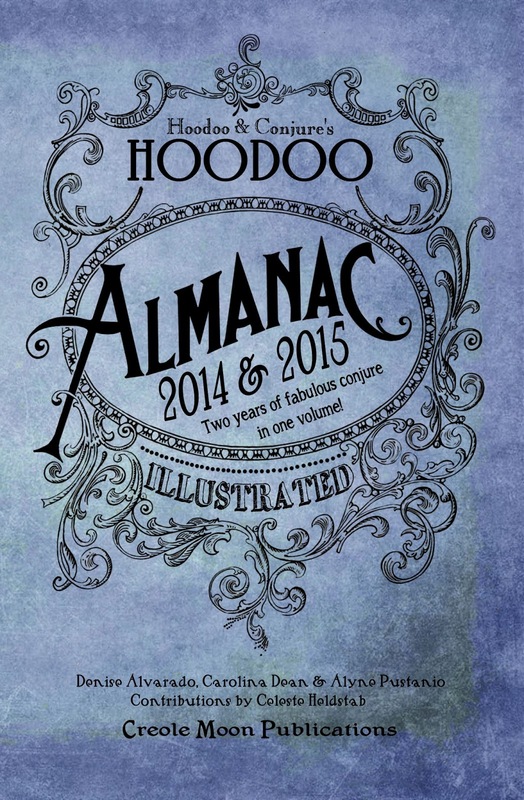 If you are simply curious, you will be forever entertained by the Hoodoo Almanac 2014-2015. On thing is for certain, and that is whoever has a copy of the Hoodoo Almanac 2014-2015 will have the edge on their competitors and will surely fill up their personal trick bags. Because we have information in this book that you won't find in one place anywhere else in the world. Hoodoo happens outside the ordinary person’s comfort zone. 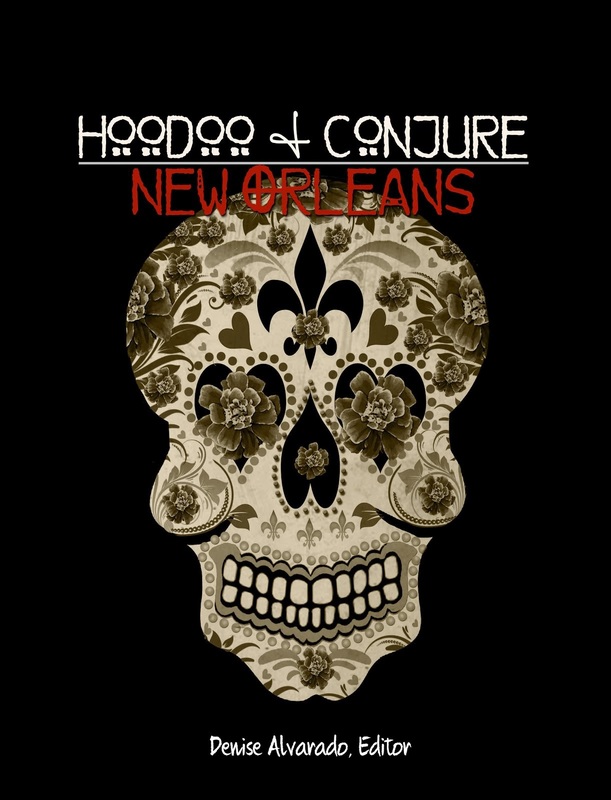 But, in the HOODOO ALMANAC, we don’t hide conjure. We parade it in the streets and give it a sweet tea. MAGIC, PURE MAGIC. THE HOODOO ALMANAC 2014-2015. With contributions by Celeste Heldstab. AVAILABLE NOW FOR PREORDER. SHIPS JUNE 1. Hello Denise! I just purchased this book. I sent you an email to the publishers email address. Could you read it and respond when you can, please? Thank you!